For web sites, speed may be feature #1. Users hate waiting, we get frustrated by buffering videos and pages that pop together as images slowly load. It’s a jarring (aka bad) user experience. Time invested in site optimization is well worth it, so let’s dive in. Caching is a great example of the ubiquitous time-space tradeoff in programming. You can save time by using space to store results. Browser: Yo! You got index.html? Sever: Totally, dude! It’s right here! Browser: That’s rad, I’m downloading it now and showing the user. Caching seems fun and easy. The browser saves a copy of a file (like a logo image) and uses this cached (saved) copy on each page that needs the logo. This avoids having to download the image ever again and is perfect, right? Wrongo. What happens when the company logo changes? Amazon.com becomes Nile.com? Google becomes Quadrillion? We’ve got a problem. The shiny new logo needs to go with the shiny new site, caches be damned. So even though the browser has the logo, it doesn’t know whether the image can be used. After all, the file may have changed on the server and there could be an updated version. So why bother caching if we can’t be sure if the file is good? Luckily, there’s a few ways to fix this problem. Browser: Hey, give me logo.png, but only if it’s been modified since Mar 16, 2007. Server: Hey, you’re in luck! It was not modified since that date. You have the latest version. Browser: Great! I’ll show the user the cached version. Comparing versions with the modification time generally works, but could lead to problems. What if the server’s clock was originally wrong and then got fixed? What if daylight savings time comes early and the server isn’t updated? The caches could be inaccurate. ETags to the rescue. An ETag is a unique identifier given to every file. It’s like a hash or fingerprint: every file gets a unique fingerprint, and if you change the file (even by one byte), the fingerprint changes as well. Browser: Can I get logo.png, if nothing matches tag “ead145f”? Server: You’re in luck! The version here is “ead145f”. It was not modified. Browser: Score! I’ll show the user my cached version. Just like last-modifed, ETags solve the problem of comparing file versions, except that “if-none-match” is a bit harder to work into a sentence than “if-modified-since”. But that’s my problem, not yours. ETags work great. Caching a file and checking with the server is nice, except for one thing: we are still checking with the server. It’s like analyzing your milk every time you make cereal to see whether it’s safe to drink. Sure, it’s better than buying a new gallon each time, but it’s not exactly wonderful. And how do we handle this milk situation? With an expiration date! There isn’t a conversation here; the browser has a monologue. Browser: Self, is it before the expiration date of Mar 20, 2007? (Assume it is). Browser: Verily, I will show the user the cached version. And that’s that. The web server didn’t have to do anything. The user sees the file instantly. Oh, we’re not done yet. Expires is great, but it has to be computed for every date. The max-age header lets us say “This file expires 1 week from today”, which is simpler than setting an explicit date. The cache headers never cease. Sometimes a server needs to control when certain resources are cached. Cache-control: public means the cached version can be saved by proxies and other intermediate servers, where everyone can see it. Cache-control: private means the file is different for different users (such as their personal homepage). The user’s private browser can cache it, but not public proxies. Cache-control: no-cache means the file should not be cached. This is useful for things like search results where the URL appears the same but the content may change. However, be wary that some cache directives only work on newer HTTP 1.1 browsers. 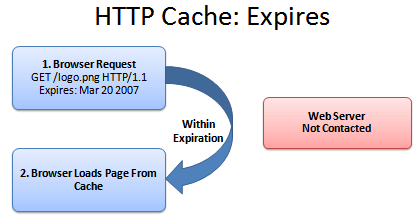 If you are doing special caching of authenticated pages then read more about caching. A general tip: the less a resource changes (images, pdfs, etc.) the longer you should cache it. If it never changes (every version has a different URL) then cache it for as long as you can (i.e. a year)! One technique: Have a loader file (index.html) which is not cached, but that knows the locations of the items which are cached permanently. The user will always get the loader file, but may have already cached the resources it points to. The following config settings are based on the ones at AskApache. All the times are given in seconds (A0 = Access + 0 seconds). In Browser: Use FireBug or Live HTTP Headers to see the HTTP response (304 Not Modified, Cache-Control, etc.). In particular, I’ll load a page and use Live HTTP Headers to make sure no packets are being sent to load images, logos, and other cached files. If you press ctrl+refresh the browser will force a reload of all files. 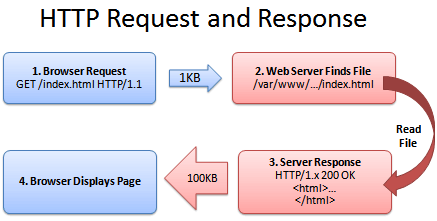 Read more about caching, or the HTTP header fields. Caching doesn’t help with the initial download (that’s what gzip is for), but it makes the overall site experience much better. Remember: Creating unique URLs is the simplest way to caching heaven. Have fun streamlining your site!